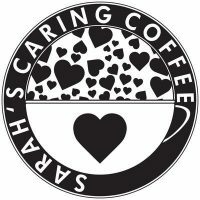 I first came across Sarah’s Caring Coffee towards the end of 2017. What piqued my interest more than anything was that it’s based in Holywell, the North Wales town where I was born and brought up, where my father still lives and where I am a very frequent visitor. 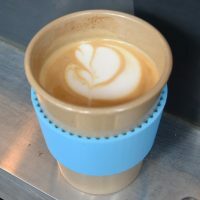 On further investigation, it turned out that Sarah’s Caring Coffee had been set up to generate income, by selling coffee on-line and at various local markets, for The Cariad Project, a charity which helps disabled people in Africa. I met the eponymous Sarah, who is behind both Sarah’s Caring Coffee and The Cariad Project, at the start of this year, and was given a bag of her Ethiopian Sidamo to take with me on my travels around North America. It graced my Aeropress from Providence to Phoenix, via cities such as New Orleans, and was a lovely coffee. I was therefore delighted when I heard in May that Sarah had opened The Coffee Bean in Holywell, providing a permanent retail outlet for Sarah’s Caring Coffee, as well as a community hub and flexible meeting space. Naturally I took the first opportunity I could to pay Sarah and The Coffee Bean a visit. Timmy Green, the latest addition to the growing Daisy Green/Beany Green collective, opened at the start of the year. It was, from the beginning, a fully-fledged restaurant as well as a rather splendid coffee shop. When I visited and wrote about Timmy Green in March, it was only as a coffee shop. This Saturday Supplement is going to redress the balance and consider Timmy Green as a restaurant. Layout-wise, Timmy Green is much the same as ever, although there have been a few changes since I was there in the spring, which has made the downstairs feel even more like a restaurant than a coffee shop. The grand piano in the corner has gone to make way for more tables, while the window-bar and high tables to the left of the door have suffered a similar fate. 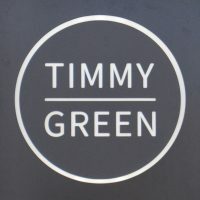 When it comes to food, Timmy Green serves breakfast, lunch, brunch and dinner, complete with desserts, wine, beer and cocktails. And, of course, Roasting Party coffee. Not that Daisy/Beany is a stranger to food. The original Daisy Green, plus the Paddington and Liverpool Street Beany Greens, have a reputation for innovative brunch menus, but in Timmy Green this has reached its logical conclusion. I first discovered L.A. Burdick in my pre-Coffee Spot days, after a recommendation by some Boston friends. It sounded so awesome that I had to seek it out when I was looking around Harvard. I must confess, I was not disappointed… When it came to starting the Coffee Spot, L.A. Burdick was one of the places I wanted to write about, but, of course, in traditional Coffee Spot style, I first visited L.A. Burdick’s New York City branch, plus the branch in Boston’s Back Bay, before finally getting around to a return visit to Harvard at the start of my coast-to-coast trip last summer. As well as being the hot chocolate equivalent of a coffee shop, L.A. Burdick sells chocolate (and chocolates), the retail space usually being of equal size to the café part. There’s also tea, coffee and a wide range of sumptuous-looking cakes. However, for me, the whole purpose of coming to L.A. Burdick is to indulge in the amazing, rich and, above all, chocolaty hot chocolate. Be warned: Harvard is smaller than the other two branches. You’ll often struggle to get a seat, having to wait for a one to become free before putting in your order. Charlie’s Sandwich Shoppe, the quintessential family-run American diner, had been in the Manjourides family since it opened in 1927, serving the people of the South End from 429 Columbus Avenue. I discovered Charlie’s in 2003 and when, in recent years, I started to stay in the South End, it became my go-to breakfast place, dishing up my favourite staples of poached eggs, home fries and griddle cakes. I wrote about Charlie’s Sandwich Shoppe in 2013, visiting again in 2014. However, towards the end of that year, I heard troubling rumours that Charlie’s had closed. It was only when I returned to Boston in June 2015 that I was able to confirm it for myself. I swung by in the vain hope that it would be open but it was well-and-truly shut, although deep inside I heard sounds of construction. Disappointed, I went on my way, ending up in the nearby Render Coffee. However, when I returned this year, I was once again walking down to Render, and, instead of finding the empty shell of Charlie’s, or something new in its place, there was Charlie’s itself, looking superficially very much as it had year after year. Intrigued, I stepped inside. 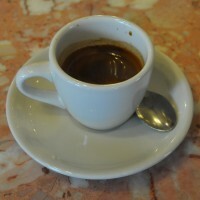 Anthony’s Italian Coffee House, on 9th Street, is a slice of culture/history in Philadelphia’s Italian Market district. Recommended (once again) by my friend and guide, Greg Cohen (of Coffee Guru App fame), Greg comes to the Italian Market to do his shopping. After taking me around several old-fashioned grocers and delicatessens, themselves a delight to visit, particularly if you like Italian food, he abandoned me at Anthony’s (“left” would be a more accurate statement, but abandoned has a more dramatic quality to it, don’t you think?). Anthony’s is an old-fashioned (in style; Wifi being just one of the concessions to the modern age) Italian-American espresso bar/café of the type that I love. Less grand than say Boston’s Caffé Vittoria or New York’s Caffe Reggio, it has more in common with Soho’s Bar Italia. This, I feel, is much more in keeping with Philadelphia’s working class, blue collar roots. Don’t come here looking for the latest third wave coffee experience though. The espresso is good, but you won’t find any single-origins or fancy hand-crafted pour-overs (although there is the obligatory bulk-brew filter). Instead, come for a slice of character and history, plus to put your feet up after all that shopping! I first came across L.A. Burdick exactly three years ago after a tip-off from a friend in Cambridge (Massachusetts, not UK). I tried the branch there and loved it, but was a little put off by how busy it was. Even late on a weekday afternoon, I still had to wait 20 minutes for a table, such was its popularity! On my trip to Boston a year ago, I learnt that there was a branch on Clarendon Street in Back Bay, around 10 minutes from my hotel. Although excited, I nevertheless approached it with some trepidation, expecting crowds. However, I needn’t have worried: it was an oasis of tranquillity in comparison. It might have helped that it was gone six o’clock on a freezing cold Tuesday evening, but I wasn’t complaining. The main draw of L.A. Burdick is the hot chocolate and the Back Bay branch is no exception. However, there’s also coffee, tea and a range of cakes and pastries. And, of course, chocolate. L.A. Burdick is definitely at the luxury end of the chocolate market and both prices and décor reflect this, making L.A. Burdick one the more sumptuously-appointed cafés you’ll visit. A roastery, coffee bar and restaurant, Caravan, in its cavernous space in an old grain warehouse next to Regent’s Canal, is many things to many people. For me, it’s always been a great place to sit inside at the counter at the back, drinking coffee and shooting the breeze with the baristas, or, on a summer’s evening, somewhere to sit outside with a carafe of one of Caravan’s many fine single-origins. It’s also one of my favourite roasters: as well as the single-origin pour-overs, I’ve always liked Caravan’s Market espresso-blend, keeping an eye out for its coffee wherever I go.